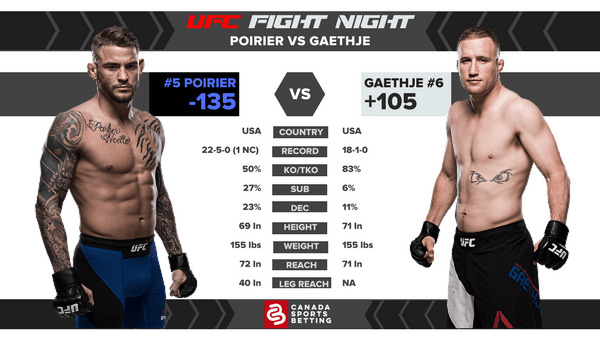 No drama needed for this UFC event: Dustin Poirier (-135) and Justin Gaethje (+105) will deliver a fight for the ages. They have to. Both fighters don't know how to fight "boring". This adjective is never uttered every time these two step into the octagon. Both fighters come equipped to finish and they pursue it no matter what the cost. When these two collide, they will attack until someone goes limp. Fight of the Night and potentially Fight of the Year is written all over this barnburner. Poirier is coming off a victory over former champion Anthony Pettis and outside of the setback to Michael Johnson, he has won every fight since his return to the lightweight division three years ago. Gaethje was an unbeatable monster and was the consensus best lightweight outside the UFC before he made his scintillating debut via a comeback victory over Johnson. "The Diamond" is the slight favourite because he is a more diverse striker. Gaethje will have the durability edge and punch-for-punch is the harder hitter but Poirier is faster, moves better, and will likely follow a smarter gameplan than Gaethje. Though after suffering his first defeat, Gaethje may make adjustments and fight a more calculated fight. It's difficult to gauge Gaethje's durability now because he physically broke against Eddie Alvarez and all the damage he's absorbed through 19 pro fights is a lot. Poirier's chin is not the best itself and one clean punch from Gaethje could put him away. Leg kicks and body shots will be the clincher here. Alvarez used body shots to wear Gaethje out while Jim Miller used leg kicks to brutalize Poirier. If Gaethje fights smart, he'll use his vicious leg kicks to immobilize Poirier and taking away his agility will make him an easier target. Likewise, Poirier can chop Gaethje down like Alvarez did and he could finish him down the stretch. Prediction: The fight is almost a 50-50 with a slight lean on Poirier due to the skill and speed advantage. However, his durability is such a concern it's hard to trust him especially if it would take more than a few shots to finish Gaethje. At these odds, side with Justin Gaethje who could land that one shot to put Poirier away. But better yet, bet that this fight does not go to decision. Lock it Up! For Arjan Singh Bullar (-410) against Adam Wieczorek (+285); while this is heavyweight and one punch can change the whole fight, Bullar should bulldoze through the Pole with his dominant wrestling. Wieczorek also doesn't possess the high-level striking to threaten too much. ASB should kill this. Who's A Good Dog? Michelle Waterson (+100) opened as an underdog but has been bet up thanks to two straight losses and a size disadvantage against Cortney Casey (-130). However, she is the better fighter with the better corner and her skills advantage should lead her to victory. Just Say No: to Carlos Condit (+140) versus Alex "Cowboy" Oliveira (-190); a fun fight on paper but also one loaded with asterisks. Condit didn't look like himself in his return fight versus Neil Magny and he could be on the decline while Cowboy is coming off a grueling war where he physically broke. Pass. The only thing hotter than Arizona is the UFC's main event and it's free on TV. And hallelujah, there were no fight cancellations! It's an early start time and Canadians get to watch for free. For extra action these online sportsbooks offer solid lines for Canadians.